These Suffolk Style shutter hinges and pintles are a great choice if you are looking for a heavy duty hinge for your shutters. The 1/2" diameter pin size makes this a very heavy duty hardware choice. These sets of shutter pintels and hinges will not only give your shutters a high end look and add dimension, but will stand up to the harshest of environments. Most of these pieces are offered in stainless steel or galvanized steel. Our shutter pintels and hinges have a black powder coat finish that will look great for years. Click on one of the products below for pricing, ordering and information! 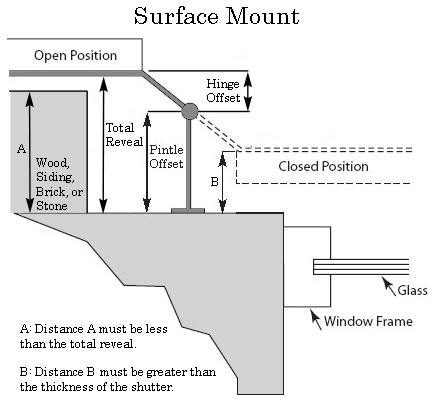 Here are a couple of pictures to explain how "Offset and Reveal" affects your shutter hinge choice.